Hi. My son recently lost his favorite toy puppy, Gol. He came with toilet paper from Kimberly Clark’s Scott brand available in Caracas, two years ago. Gol is a very small puppy. It fits in a child’s hand. 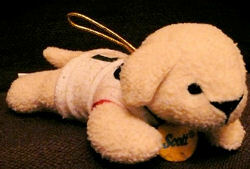 He’s light yellow (like a Labrador), with a golden thread to hang it from (like from your finger), and the collar tag is a yellow felt oval that reads Scott (from Kimberly Clark’s Scott brand toilet paper). Gol (which in Spanish means Goal) is my 4 year old son’s best buddy. He’s in all his dreams and fantasies, and he takes him almost everywhere. I’m trying to find a replacement, as I honestly doubt such a small toy can be found again.